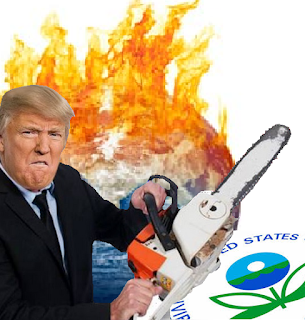 Donald J Trump has begun to deliver on his promise to gut the Environmental Protection Agency (EPA). The Trump administration announced that it has suspended all new business activities at the EPA. In addition to silencing the EPA, The Washington Post also reports that Trump has muzzled the Interior department and the Agriculture department. Scientists at the agriculture department have been ordered to stop publishing "outward facing" documents and news releases. "Starting immediately and until further notice, [the Agricultural Research Service] will not release any public-facing documents. This includes, but is not limited to, news releases, photos, fact sheets, news feeds, and social media content," wrote ARS chief Sharon Drumm in an email to employees. In addition to the media blackout at the EPA, the Trump administration barred staff from awarding any new contracts or grants. "Incoming media requests will be carefully screened," one directive said. "Only send out critical messages, as messages can be shared broadly and end up in the press." Trump's pick to lead the EPA is a climate denier with ties to the fossil fuel industry by the name of Scott Pruitt. Liz Perera, climate policy director for the Sierra Club, said Trump’s muzzling of the EPA should be seen as, "a major red flag for all Americans." There are concerns that this will impede the agency's ability to deal with responsibilities that it commonly contracts out. This includes everything from toxic cleanups to water quality testing.